Are you looking for fun, engaging and standard based homework for you kindergarten classroom? Look no further! This homework calendar is made from the kindergarten common core standards! There is two nights of non-worksheet literacy homework and one night of math non-worksheet homework! You will only have to make one copy per child per month! 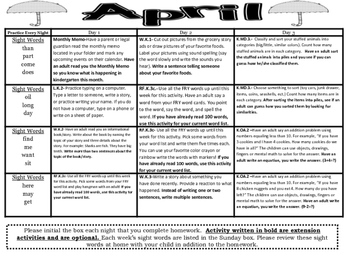 Also, this homework reviews all 100 FRY words through the year and each night has an extension activity for your children who might need a little more challenge than the basic nightly homework will give them! Because reading to children each night is so important, there is a small picture in the daily box that the parents check when they read to their child. A small reminder to help them remember! If you have any questions please let me know!